The jars are out of the kiln. This is probably one of the greatest things about making pottery; opening the kiln. 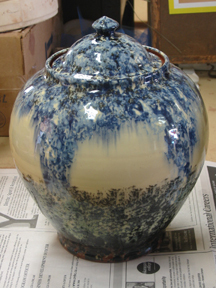 There are few other materials that go through such a transformation from start to finish as clay. About 30 years ago I had the opportunity to build a kiln for the Lorenzens who were potters here in Nova Scotia for 30+ years. I was definately the young kid on the block and was very flattered to have been asked to do the job. (I had just returned from a kiln building workshop at the Banff Centre where we built the kilns for the then brand new Ceramics Studio) In conversations after supper with Alma and Ernst, I discovered the anticipation never leaves. Now that I have been potting for 30 years, I know that statement to be true. I will now show the jars in the same order as my previous post, so that you can see the changes. 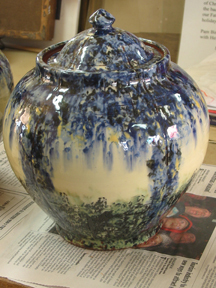 There is a black and green slip coming up from the bottom, with black, dark blue and pale blue slip under the transparent glaze coming down from the top. In the next jar, I wanted to loosen up the slip application. You can now see the runniness of the dark blue slip into the white space. I like this kind of vegetation feeling that is happening, sort of remenisent of Tiffany’s stained glass wisteria panels. Here is jar # 3 with the addition of a bit of yellow slip. I like how the slip is fitting better on the form. The jar was divided into 5 “panels”, which seems to be a more active number than 4. 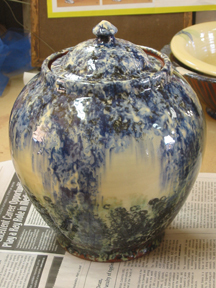 Here is the last jar with the addition of the “trellis” underneath the slip. It is kind of hard to see the framework but it adds a nice structure/order for the looser slip overtop. I think I would like to explore, in the next series of jars, having the green slip on the bottom, extend up into the white space hopefully giving a sense of distance. This may or may not work but that is the nature of the creative process. I like the idea of playing with that open white space which falls on the fattest part of the form. Making that area recede with the runny green slip could be an interesting effect. You can now see the need for the ability to see into the future. A painting would have aspects of that future vision while you are thinking about the image, but once you are into the act of laying on paint, the image will change before your eyes and you see what you are going to get. Clay requires that “trial by fire”. It is fascinating that each material has very specific differences but there are similarities as well. I’m interested in how other people, regardless of material, conceive their ideas. I can always make another one. This simple phrase has taken me many years to finally embrace fully. I really think this notion has coloured my whole approach to life as well. 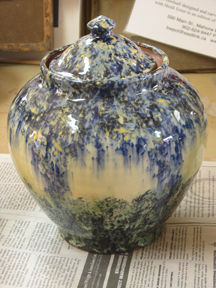 In making pots, if you truly believe you can always make another one, then this takes the pressure off. It allows you to be freer and try things you might not attempt if you maintain the “precious” frame of mind. I think the very nature of production pottery lends itself to this approach as you are making multiples of things as opposed to spending weeks on a single piece. Just a different approach I guess, but very metaphoric for life.